How to use NEW Upload Key to sign app update and upload to Google Play store? Somehow I managed to save the wrong keystore for my Android app that I developed using Xamarin and already published. the SHA certificate did not match. Luckily I was registered for Google Play App Signing so they were able to reset the Upload Key for me. Now that I have a *.pem file and *.jks file, how do I create the new APK file for my Xamarin Android project, signed with the new upload key in Visual Studio? I have the same problem, i missed my keystore file and i want to update app in play store. After sending the *.pem file to Google Play Developer support in order to reset the Upload Key, they confirmed it was successfully reset (yay Google App Signing) but it takes a couple of days for it to be active. In the Archives menu option, select the latest archive and click Open Folder. This opens a folder where an unsigned *.apk file resides. It needs to be signed manually (in step 4) with the *.jks keystore file mentioned above (keystore.jks). The signing process will ask for the password used when creating the keystore.jks/*.pem file. After, the apk resulting is ready to upload to the Google Play Store as an app update. Keystore.jks is now the new Upload Key. i think you said about this ssl-cert-snakeoil.pem. this is path of this file. but how can send it in google play developer. Let me know if you got it working, or if you have other questions. Thanks for reply and guide me. Thanks for contacting Google Play Developer Support! The new key will be usable from: 2019-01-20 16:13:12 UTC. but i can't able to find new keystore file and where is. @DeepakDY No worries, we are all here to help eachother. If I remember correctly when you created the *.pem file there was also a *.jks file created? That *.jks file IS your new upload key. Somehow I managed to save the wrong keystore for my Android app that I developed using Xamarin and already published. When I wanted to upload an update to the Google Play Store with the keystore that I thought was the right keystore, the SHA certificate did not match. Firstly i generated a new archive and new keystore for the Android project in Xamarin. then i ran keytool -genkeypair -alias upload -keyalg RSA -keysize 2048 -validity 9125 -keystore keystore.jks for generate keystore.jks file(i thinks this is new upload key this file(keystore.jks generated in this path "C:\Program Files (x86)\Java\jdk1.8.0_192\bin")) when i am ran this command this ask me some information about new archive such as(alias, organization, organization unit, location, county code, password and repassword). *.pem file and its generated in this path "C:\Program Files (x86)\Java\jdk1.8.0_192\bin". then i send *.pem file to google play support. where i am wrong here. Let me know if it worked, or if I didnt understand your question. but not get my-app-unsigned-aligned.apk . @DeepakDY put the files (your app apk package and your jks key) in the same folder and run the command prompt from within that folder. Or use command prompt to make sure you are in the folder where the apk resides. Also copy the JKS key file to that folder. Now i am able to update my application. I put *.apk and *.keystore file in this path "C:\Program Files (x86)\Android\android-sdk\build-tools\25.0.3"
because zipalign.exe file was here and ran this command "C:\Program Files (x86)\Android\android-sdk\build-tools\25.0.3>zipalign -v -p 4 com.crm.office24hr.apk com.crm.office24hr-aligned.apk". 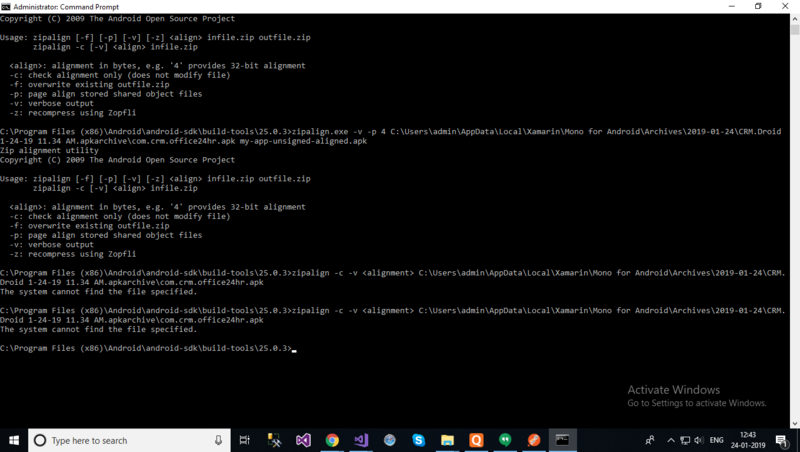 and generated *-aligned.apk same folder"C:\Program Files (x86)\Android\android-sdk\build-tools\25.0.3". then Ran this command "C:\Program Files (x86)\Android\android-sdk\build-tools\25.0.3>apksigner sign --ks keystore.jks --out com.crm.office24hr.apk com.crm.office24hr-aligned.apk" signer apk in same folder "C:\Program Files (x86)\Android\android-sdk\build-tools\25.0.3". signer apk is final apk and update app in play store.